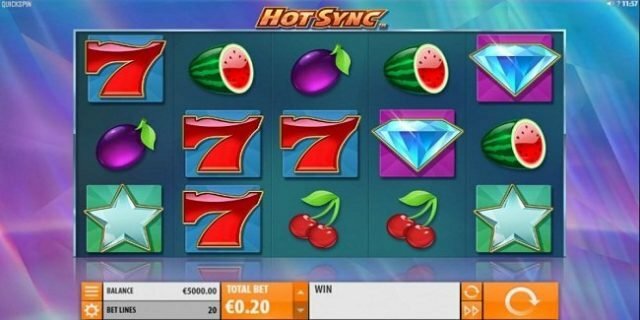 Hot Sync is a QuickSpin based video slot game. The game is 5 reels and 20 paylines and it offers a jackpot of 10 times. Return of the player percentage for the game is 96.39%. Minimum and maximum coins per line for the game are 1 and coins size range is 0.01 to 5. Hot Sync Slot features exciting bonus features. The platform uses symbols like diamonds, red sevens, stars and bells. You can play this game at any QuickSpin based online casino site. There are three basic options available in this game and they are “Total bet”, “Auto Play’ and “spin”. The option “Total bet” is used to set the coin value, “AutoPlay” is used to Spin the reels for a preset number of times and “Spin” button is used when a player wants to play the game. The wild symbol here in this game is the word ‘Wild’, which can be substitute for all other symbols except bonus symbols and hot sync wild icons. Wild helps players to win big amount of money. When a player lands of 2 Hot Sync Wild symbols the Hot Sync Re-spin feature would be activated. Bonus symbol will occur on reel 2, 3 and 4 only in the base game. If players land on at least 3 bonus symbols they would get 8 free spins. During these free spins, the hot sync symbols will turn hot. Additional free spins can also be won during re spin feature.